One of the biggest risks to Apple (NASDAQ: AAPL) stock is the tech giant’s dependence on the iPhone. The smartphone segment accounted for 62% of Apple’s trailing-12-month revenue and represents an even larger share of the company’s profits. Headwinds for iPhone, therefore, could translate into tough times for Apple stock . Fortunately, two Apple product segments — services and other products — are morphing into meaningful catalysts to help sustain Apple’s growth. But services saw its year-over-year revenue growth rate decelerate in Apple’s most recent quarter, while a trend of accelerating growth in other products came to a halt. Will these tailwinds prove to be short-lived? A beneath-the-surface look at Apple’s services and other-products segments shows how both catalysts are still benefiting from significant momentum. In its fourth quarter of fiscal 2017, services and other products revenue was up 34% and 36%, respectively. That was up sharply from 22% and 23% year-over-year growth for the two segments in Q3. But this momentum appeared to end in Apple’s first quarter of fiscal 2018, when the company reported year-over-year revenue growth for services and other products of 18% and 36%. These first-quarter growth rates, however, fail to take into account the impact of Apple’s shorter first quarter in fiscal 2018. During Apple’s first-quarter earnings call , CFO Luca Maestri was careful to point out how different services revenue growth would have looked had the quarter included the same number of weeks as the year-ago quarter. “Turning to services, we had a terrific quarter, with revenue of $8.5 billion, up 18% year over year, and up 27% in terms of average revenue per week,” Maestri explained. After accounting for these adjustments, Apple’s services revenue growth would have accelerated in each of the previous three quarters. Meanwhile, Apple’s recent acceleration in other-products revenue would have been particularly pronounced. Data source: Apple quarterly operating data. Fourth-quarter 2017 year-over-year services revenue growth is adjusted to exclude a one-time favorable adjustment. First-quarter 2018 revenue growth is adjusted to exclude the impact of a shorter week. Given how strong Apple’s growth in services and other-products segments has been recently, investors shouldn’t get their hopes up for growth to keep accelerating. But there’s plenty of reason to expect strong double-digit growth to persist over the long haul. App Store. Image source: Apple. In addition, Apple’s growth in paid subscriptions across its services offerings is astounding — up 58% year over year, hitting 240 million. 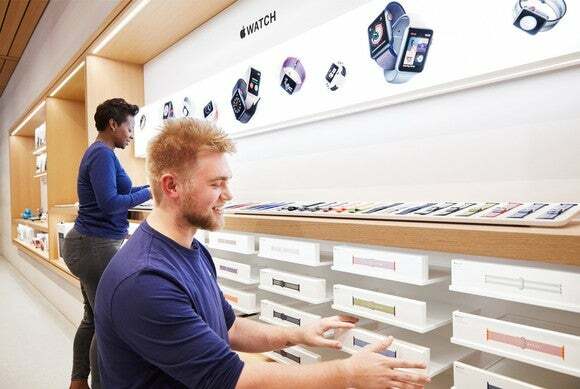 Other products, which includes revenue from Apple TV, Apple Watch, Beats products, iPod Touch, and accessories, is benefiting from extremely strong growth in its wearables products (Apple Watch, AirPods, and Beats headphones). Wearables revenue was up 70% year over year in Q1. In the same period, Apple Watch revenue and units sold were up 50% year over year. Notably, Apple also said sales of its new Apple Watch Series 3 models were twice the volume of Series 2 sales in the year-ago quarter. Together, services and other products accounted for about 16% of Apple’s first-quarter revenue, up from about 14% of revenue in the year-ago quarter. These product segments’ importance to Apple’s business should continue to increase, helping Apple grow its business and reducing the risk of its dependence on the iPhone. Daniel Sparks owns shares of Apple. The Motley Fool owns shares of and recommends Apple. The Motley Fool has the following options: long January 2020 $150 calls on Apple and short January 2020 $155 calls on Apple. The Motley Fool has a disclosure policy .